India's Polar Satellite Launch Vehicle blasted off Thursday with a radar surveillance satellite designed to obtain all-weather, day-and-night ground imagery for national security and environmental applications. 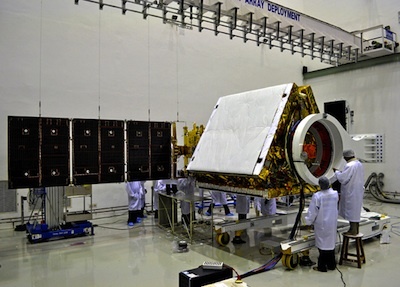 The satellite, named RISAT 1, marks a significant leap for India. It is the country's first indigenous radar observation satellite after a successful series of optical and infrared imaging missions. The Indian Space Research Organization, or ISRO, developed the satellite to help emergency officials respond to disasters like floods and cyclones. RISAT 1 will also monitor crops during India's monsoon season, according to ISRO. "This spacecraft reaches the common man in different application areas like agriculture, natural disaster management, forestry applications and also crop estimation," said N. Valarmathi, RISAT 1's project manager. Indian defense officials could also use RISAT 1 to eavesdrop on the country's fractious border regions and neighboring countries. The 146-foot-tall PSLV launched at 0017 GMT Thursday (8:17 p.m. EDT Wednesday) from the Satish Dhawan Space Center on Sriharikota Island, India's primary launch site on the country's east coast. Liftoff was at 5:47 a.m. local time - minutes before sunrise - at the seaside launch site. The 350-ton rocket soared into a predawn sky, catching rays of sun as it ascended into the upper atmosphere trailing a twisting plume of exhaust from its solid-fueled motors. The PSLV's six strap-on solid rocket boosters, extended and packed with extra propellant, were all jettisoned in the first 90 seconds of the flight. 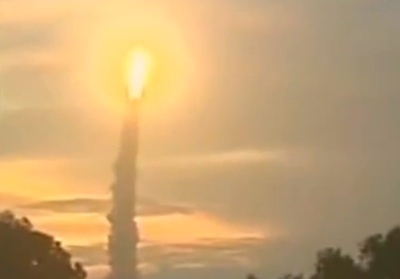 The souped-up version of the rocket launched Thursday is called the PSLV XL. The RISAT 1 mission was the third flight of the PSLV XL configuration. The PSLV XL was needed to loft RISAT 1, which weighed nearly 4,100 pounds at launch, the heaviest spacecraft ever launched by India's PSLV family. The four-stage launcher flew south from the launch site before deploying RISAT 1 over the Indian Ocean less than 18 minutes after liftoff, successfully concluding the PSLV-C19 mission, which cost about $95 million, according to Indian media reports. The satellite was released in an orbit almost 300 miles above Earth with an inclination of approximately 97.6 degrees, according to Indian officials. "I'm extremely happy to announce that the PSLV-C19 mission is a grand success," said K. Radhakrishnan, chairman of the Indian Space Research Organization, or ISRO. "This is the 20th successful flight of our PSLV, and it injected precisely India's first radar imaging satellite into the desired orbit." The expendable PSLV has launched 21 times since 1993. All but one of the missions have reached orbit. RISAT 1 will raise its orbit to an operational altitude of 333 miles user on-board thrusters beginning Friday, according to ISRO. The craft will circle Earth 14 times a day with a ground track repetition every 25 days. 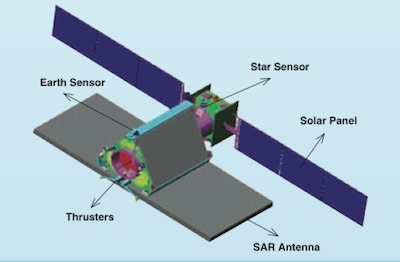 The RISAT 1 spacecraft's C-band radar will see through clouds and take pictures of the ground at night, offering a significant leap in technology and reconnaissance data over existing optical imagers. Because they do not require sunlight to illuminate the ground, radar pulses emitted from orbiting satellites can resolve objects on Earth's surface in darkness and in all weather conditions. India launched the RISAT 2 satellite in April 2009 with an Israeli-built X-band radar payload. RISAT 1 is India's first satellite with homemade radar technology. "India is joining a select few countries, the U.S., Europe, Canada and a few more, who have this complex technology," Radhakrishnan said in post-launch remarks. "But what it means for the country is that we can now make forecasts for agricultural crops using this satellite, and we can use it for disaster management applications, and it [allows] the opening of several other new applications." Radhakrishnan and other officials refrained from discussing RISAT 1's potential military applications. RISAT 1 unfurled its solar panels to generate electricity and deployed its 20-foot radar array antenna a few minutes after separating from the PSLV upper stage, ISRO officials said. The first images should be returned from RISAT 1 in about five days. Officials announced the next PSLV mission will launch in August with the Spot 6 optical observation satellite for Astrium Services.